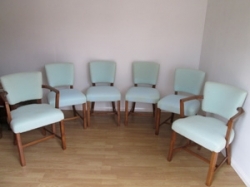 Art Deco dining chairs x6 made by the company Maple and Co – a top quality set of chairs with the original maker’s labels for each chair. 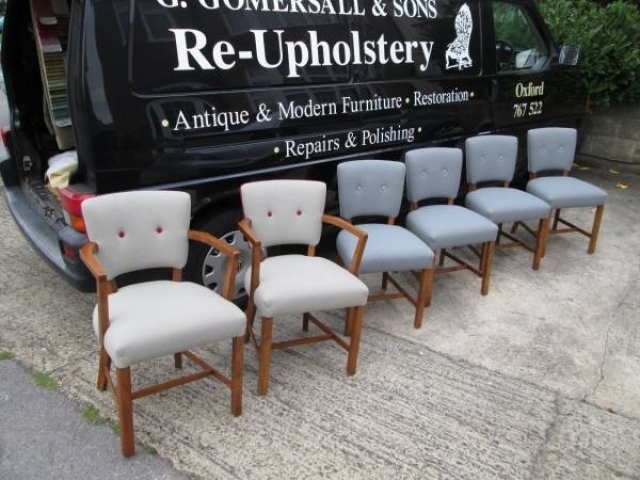 Re-upholstered to the latest fire retardant specification – recently polished beech wood frames, just awaiting top cover as per customer’s choice. The second picture displays the gorgeous chairs fully restored and re-upholstered in a previous customers fabric choice, making the chair set totally unique and individual. Dimensions – height 85.5 cms, width (Carver – 54 cms and dining chairs 47 cms), depth (Carver 55.5 cms and dining chairs 54 cms).